Issues: KH3D information; fix image sizes; add roles to apprentices; correct tenses as appropriate (past tense should not be used for BbS). Expand KHUX information. The following is a list of known Keyblade wielders, characters who have successfully wielded a Keyblade in battle. Not included are characters who have held a Keyblade only for it to return to the hand of its true holder, such as Leon or Jack Sparrow, as a Keyblade will refuse to be wielded by anyone without a strong enough heart. The Master of Masters is responsible for creating the Book of Prophecies using his gift of foresight, as well as for training his six apprentices, Luxu, Ira, Invi, Aced, Ava, and Gula. Foreteller Invi is the leader of the Anguis Union, and one of the six apprentices of the Master of Masters. Foreteller Gula is the leader of the Leopardus Union, and one of the six apprentices of the Master of Masters. Foreteller Ira is the leader of the Unicornis Union, and one of the six apprentices of the Master of Masters. Foreteller Aced is the leader of the Ursus Union, and one of the six apprentices of the Master of Masters. 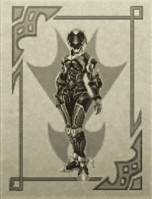 Foreteller Ava is the leader of the Vulpes Union, and one of the six apprentices of the Master of Masters. 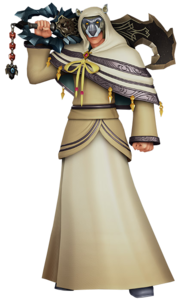 Master Luxu is one of the six apprentices of the Master of Masters, and the only one of their number to not become a Foreteller. He was bequeathed the enigmatic No Name Keyblade as a part of his mission to carry out the Master's will. 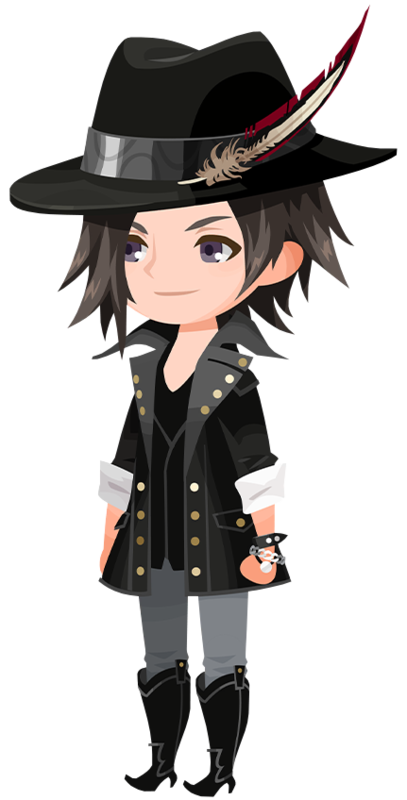 Xigbar is the current incarnation of Luxu. He is therefore able to wield, but chooses not to as part of his agenda. He is the true master of the ancient No Name Keyblade. Master Xehanort is a Keyblade Master that devoted himself to the darkness, wishing to obtain the χ-blade and thus enter Kingdom Hearts. To this end, he contrived numerous plots and manipulated many people into becoming pawns of his device. Eventually, he used his Keyblade to transfer his heart into Terra's body, becoming the present Xehanort and his other incarnations. 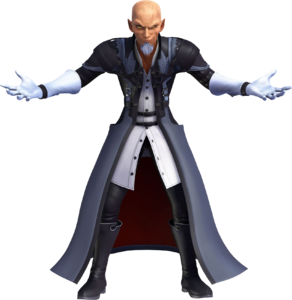 Master Xehanort is, in one form or another, behind nearly everything that has happened in the Kingdom Hearts series so far. His Heartless, Ansem, Seeker of Darkness, and his time-traveling younger incarnation, Young Xehanort, were unable to wield a Keyblade themselves; however, each incarnation found a way around this setback. Ansem possessed the body of the nascent Keyblade wielder Riku, allowing him to wield the Keyblade of heart, while the reincarnated Master Xehanort possessed Young Xehanort's body when it was under attack by Mickey and Riku, allowing him to attempt to repel the duo using the Master's own Keyblade. Being the Nobody of this Keyblade Master, Xemnas may have also been able to wield a Keyblade, but preferred not to. The No Name Keyblade is claimed by Young Xehanort to be the oldest surviving Keyblade, and to possess a connection to the Keyblade War. Its primary Keychain gives it a black form resembling the Foretellers' Keyblades, but with a goat in place of their respective animals. It contains a Gazing Eye on its head and keychain token. 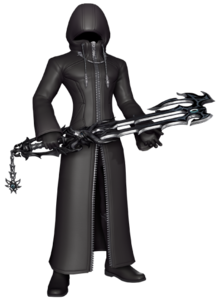 While possessing his younger self's body, Master Xehanort uses a Keychain that gives his Keyblade a shape resembling a fusion of its normal form and the No Name Keychain obtained by Terra, Ventus, and Aqua. Master Eraqus is a Keyblade Master who protected the Land of Departure and served as Terra, Ventus, and Aqua's teacher. After Aqua was named a Keyblade Master, Eraqus told her the secret responsibilities that came with such a title. Eraqus was slain by his former friend, Master Xehanort. Eraqus's Keyblade, the Master's Defender, has a very simple design. His Keychain is the "Mark of Mastery" symbol. After Eraqus's murder, his Keyblade was passed on to Aqua. Master Aqua is a Keyblade Master who operated before Sora ever embarked on his first journey. Her standard Keyblade is the Rainfell, but it later transforms into the Stormfall. Aqua's Keyblades are of average length in comparison to Terra and Ventus's; she inherits Eraqus's Master's Defender after she finds the abandoned weapon in the Land of Departure, which is slowly being swallowed by the darkness. Aqua's attempt to save Terra after he falls into the Realm of Darkness causes Aqua to lose her Keyblade; the Master's Defender becomes her only weapon in the dark realm. Aqua unintentionally bequeathed a Keyblade to Kairi in Radiant Garden; Kairi touched Aqua's Keyblade by mistake when attempting to get away from several Unversed at the entrance to Ansem the Wise's castle. Anti-Aqua is Aqua after having been corrupted by the darkness beneath the End of Sea by Ansem, Seeker of Darkness. Despite having no Keyblade of her own and seemingly having lost most of Aqua's powers, she is able to wield Mickey's Keyblade which she stole. Master Yen Sid is a retired Keyblade Master who now watches over the Lanes Between and counsels with stars for guidance, and appears to be the original owner of Mickey's Star Seeker Keyblade. After the catastrophic battle at the Keyblade Graveyard, Mickey returns the Star Seeker, believing that he has failed Yen Sid, but Yen Sid hands it back, encouraging him. As an apprentice to Master Yen Sid, Mickey wields the Star Seeker, a gift to him from his master. His adventures with Ventus and Aqua actually comprise his Mark of Mastery exam, and after their disappearance, he returns to the Mysterious Tower, feeling he has failed the exam, his friends, and his master. He returns the Star Seeker to Yen Sid, but Yen Sid returns it, revealing that Mickey has in fact passed his exam and become a Master. After the Heartless plague began and worlds began disappearing, Mickey set out to find a Keyblade from the Realm of Darkness in order to seal the Door to Darkness alongside a Keyblade from the Realm of Light, and stop the Heartless. He obtained the Kingdom Key D during that journey. 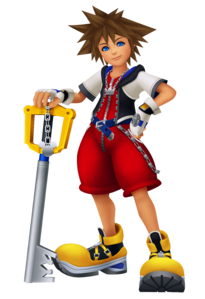 The Kingdom Key D is identical to Sora's Kingdom Key, except that the colors are reversed, the hilt being silver and the blade gold. Some materials give this Keyblade the name "Kingdom Key DarkSide". 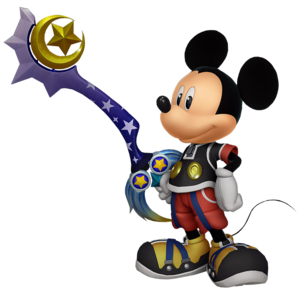 While investigating Jiminy's Journal after the defeat of Xemnas, King Mickey returns to wielding his Star Seeker. He then switches back to the Kingdom Key D when he went to rescue Sora from Master Xehanort's clutches. When Riku and Mickey go to the Realm of Darkness to find Aqua, they are attacked by a Demon Tower, which destroys Riku's Way to the Dawn. Riku leaves it there for the Riku Replica, whom he refers to as "the other me." Upon returning to Yen Sid's tower, he obtains his new Keyblade, Braveheart. The Players of Kingdom Hearts χ are a group of Keyblade Wielders who were alive at the time of the Keyblade War. They each belong to one of the unions. 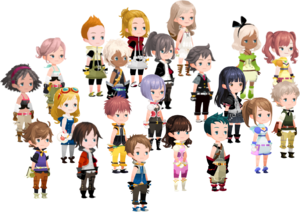 Other Players appear in Kingdom Hearts χ, sometimes fighting alongside the main Player as a member of their Union, other times competing against them as members of other Unions. These Players generally wield a basic Starlight Keyblade, though some instances wield other Keyblades. The six original members also attend the Weekly Solo Rankings parades alongside seven additional members, with eight of them lining the avenue and, in Kingdom Hearts χ[chi], five of them following the Player. In Kingdom Hearts χ[chi], eight of these, alongside three additional members, represent both parties in the daily Team Battle skirmishes. Ephemer is a Keyblade wielder who desires to find the true purpose behind the gathering of Lux and the structure of the World. 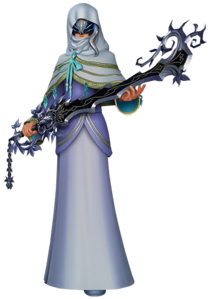 Skuld is a Keyblade wielder who is part of the same Union as Ephemer. The Dandelions are a group of Keyblade wielders secretly formed by Foreteller Ava, as instructed by her Master, to ensure the survival of the Realm of Light. They are the "children" who survived the Keyblade War and recreated the lost world. Strelitzia is a Keyblade wielder and member of the Dandelions. She was meant to be one of the new Union leaders, but was struck down by an unknown assailant. Ventus is a Keyblade apprentice from before the events of the first Kingdom Hearts. During the age of fairy tales as a member of the Dandelions, he originally wielded Missing Ache. Ventus would later go on to use a different Keyblade named Wayward Wind. His Keyblades are often shorter than those of Terra and Aqua. During his final battle at the Keyblade Graveyard, Vanitas possesses his body in order to summon and wield the χ-blade. However, Ventus destroys it in the Dive to the Heart, using his own Keyblade. When Aqua tries to figure out where she should carry him to, Ven's body reacts and summons Wayward Wind to open the pathway to the ruined Land of Departure. Brain is a Keyblade wielder and member of the Dandelions, he is meant to be one of the new Union leaders. 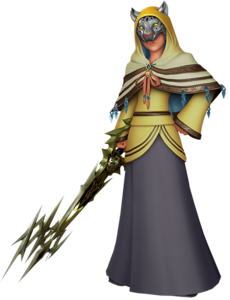 Lauriam is a Keyblade wielder and member of the Dandelions, he is meant to be one of the new Union leaders. Elrena is a Keyblade wielder and member of the Dandelions. Terra is a Keyblade apprentice from before the events of the first Kingdom Hearts. His original Keyblade is named Earthshaker, but it later transforms into the Ends of the Earth. His Keyblades are often much longer than those of Ventus and Aqua. Terra initiated the Bequeathing with Riku on the Destiny Islands before the destruction of the Land of Departure and made Riku promise keep it a secret. After Master Xehanort possesses Terra's body and becomes Terra-Xehanort, he retains the ability to summon his original incarnation's Keyblade, though he wields it like Terra would. Terra-Xehanort used his original incarnation's Keyblade to fight the Lingering Will and Aqua. After being defeated, Terra's heart begins to fight back, causing Xehanort to stab himself in order to rid himself of Terra, but accidentally sealing his memories and thus his ability to wield a Keyblade, ultimately forgetting everything but the name "Xehanort". Terra-Xehanort's Nobody Xemnas was never shown utilizing a Keyblade, however he may have been capable of doing so and simply chose not to, he did at one point utilize Xehanort's Keyblade Armor. After Master Xehanort possessed Terra's body and became Xehanort, Terra's powerful thoughts and desires animated his armor as the "Lingering Will". As a remnant of Terra, it is able to wield his Ends of the Earth Keyblade. Ventus-Vanitas is the result of the union between Ventus and Vanitas during their final battle and as such, Ventus-Vanitas is able to wield both the incomplete and complete versions of the χ-blade. Sora gained the ability to wield the Keyblade when he reached out his heart to Ventus after sensing Ventus's shattered heart. By joining his heart with Ventus's he gained the ability to wield his own Keyblade, as well as Ventus's. Sora has been recognized as having the skill to become a Keyblade Master, and is even often informally referred to as one, but has not officially received the title. Sora's Heartless was also able to continue utilizing his Keyblade after Kairi helped him to regain physical form. Sora's Keyblade is a Keyblade from the Realm of Light, and it appears before him as his home world, Destiny Islands, is consumed by the Heartless. Its default form is the Kingdom Key, which uses a Hidden Mickey as its token. Sora is sometimes able to use other wielders' Keyblades; for example, when fighting Roxas he is able to steal Roxas's Oathkeeper and Oblivion, for a total of three Keyblades, and at one point during their final battle with Xemnas, Riku lends his Way to the Dawn to Sora. 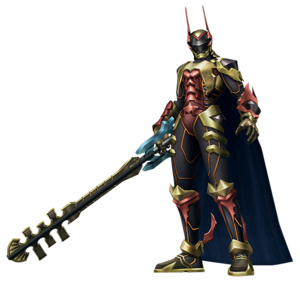 Armored Ventus Nightmare is Sora clad in Ventus's Keyblade Armor. When Riku travels to Sora's Dive to the Heart, the Armored Ventus Nightmare appears out of the darkness and engages him in battle. As Armored Ventus Nightmare, Sora continues to wield the Kingdom Key, however it has been corrupted by darkness. As the Nobody of Sora, Roxas is also able to wield the Kingdom Key. In fact, Roxas was able to wield the Keyblade at the same time as Sora because his Keyblade was "lost" by Sora in Castle Oblivion. As the "Key of Destiny" of Organization XIII, Roxas is the only member able to actually collect hearts. Like the other Organization members, Roxas is able to modify the form of his weapon using Gears. 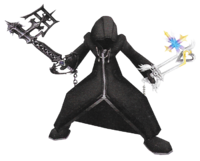 In order to duplicate this ability, and to replace Roxas with an even more malleable puppet, the Organization created the Replica, Xion. 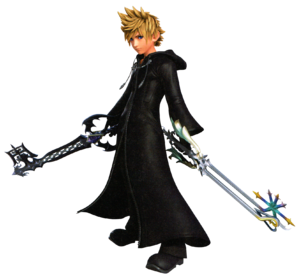 Xion gradually leeches Roxas's powers over the Keyblade, but when the two are forced into mortal combat, Roxas eventually defeats her and reabsorbs his lost powers. 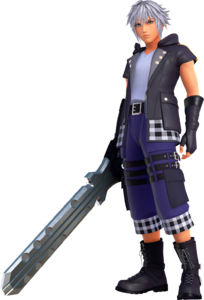 This awakens his latent Synch Blade ability, in which he is able to wield both the Oathkeeper and Oblivion, which represent Sora's memories of Kairi and Riku. As Roxas essentially is Sora, Sora is also able to use Synch Blade. Due to the constant lies the Organization had been feeding him about Xion and himself, Roxas leaves the group and eventually returns to Sora, leading them to attempt to use Sora's Keyblade for their own goals. 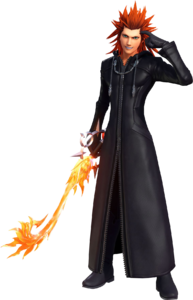 Xion, the fourteenth member of Organization XIII, can wield Roxas's Keyblade due to the fact that she is his Replica; however, the Keyblade she normally wields is nothing more than a sham. She is created from the memories belonging to Sora that Roxas holds. As a being created out of memories, she was able to use the Kingdom Key to manipulate the power of light in the same way that Sora and Roxas can. 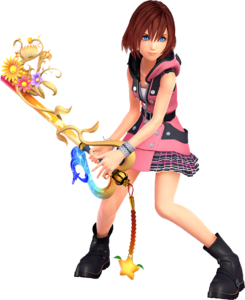 When acting as a member of the real Organization XIII and as one of the Guardians of Light she utilized a real Keyblade. Similar to its real-world counterpart, Data-Sora wields a data version of the Kingdom Key. He utilizes this mighty blade to fend off Heartless and Bug Blox. Data-Sora gains the Keyblade in the data Awakening, but loses it to the real Maleficent in data Agrabah. However, even though he is merely a data construct, the strength of his heart recreates the Keyblade in data Hollow Bastion. Formerly the Nobody Axel, Lea has gained the ability to wield a Keyblade by seeking training under Master Yen Sid who, with the help of Merlin and the Three Good Fairies, compressed the time needed to train with magic. The Riku Replica is a copy of Riku who can wield a copy of his Soul Eater. Riku later gives him his Way to the Dawn Keyblade. The Replica versions of Vanitas, Terra-Xehanort, Young Xehanort, and Xion wield their respective primary Keyblades. The version of Dark Riku wields his Soul Eater. The No Heart is a digital simulation of Xehanort in his Keyblade Armor. It only appears in the "Foresight unto Darkness" battle in the Mirage Arena. 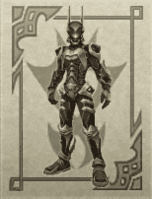 The Armor of Eraqus is a digital simulation of Master Eraqus in his Keyblade Armor. It only appears in the "Light's Lessons" battle in the Mirage Arena. As an Unversed created from the powerful thoughts and feelings of Vanitas, the Vanitas Remnant has the power to carry a Keyblade of its own, a monochrome version of Vanitas's Keyblade, the Void Gear. In Kingdom Hearts Birth By Sleep, the Mimic Master can be fought in the Mirage Arena. Mimic Master is able to create copies of Terra, Aqua, and Ventus, which possess their moves and their original Keyblade. AntiSora, a Heartless made by Riku to mimic Sora's appearance and abilities, carries a shadowy copy of the Kingdom Key. The Sora's Heartless, a digital manifestation of Sora's time as a Heartless, can take on the AntiSora's shape in its latter phases, and it also wields the fake Keyblade. In Kingdom Hearts Re:Chain of Memories, during one of Zexion's schemes, he disguises himself as Sora and uses a fake Kingdom Key to envelop Riku in light. Later when his plan fails, he decides to fight with Riku. During their battle he steals Riku's cards and makes copies of the Soul Eater for his clones and him to use. He also makes Dummy Cards, which stun Riku. 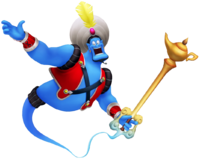 In Kingdom Hearts II, when Genie becomes a summon partner for Sora, he can copy Sora's Drive forms and wields his own copy of the Keyblade. In each form, he can perform a different kind of attack. This Keyblade is attached to his tail as if Genie was the Keychain. 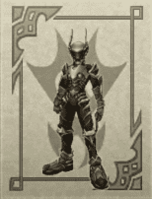 Data-Riku is the digital avatar of Jiminy's Journal, taking the form of Riku. He wields a digital copy of Riku's Soul Eater. During his battles with Data-Sora, Data-Roxas wields data construct versions of the Oathkeeper & Oblivion Keyblades. Phantom Aqua is an illusory copy of Aqua created by her own heart. It wields an illusion of Master's Defender. Dark Riku is Riku Replica as a time-traveling seeker of darkness, as such he wields his copy of Soul Eater. Anti-Riku is a dark copy of Riku who only appears in the multiplayer mode of Kingdom Hearts 358/2 Days. Like Riku in the final boss fight, Anti-Riku wields the Oblivion, though it is much darker than the ordinary version of the Keyblade. ↑ Nomura Interview "It's possible that [Xemnas] intentionally wasn't using [a Keyblade]." ↑ Young Xehanort: "But of all the Keyblades in existence, Master Xehanort's is the most ancient. That is my destiny. But it has yet.. to become a reality." / Braig" "Hey, it's okay. This is all connected to the ancient Keyblade War, isn't that right?" ↑ Director's Secret Report XIII, p. 28; Tetsuya Nomura: "That Keyblades are Light and Dark is not to say that there is one per side, and there exist as many of them as there are hearts of those who possess the capability. At the current stage, in regards to the requirements for possession, the only requirement that has become obvious is for "those whose hearts are strong", but there are also other requirements that have not yet been made clear, and we plan to reveal them at another opportunity. In nature, Riku's "Way to the Dawn" and the Keyblade that Kairi possesses have become objects of the same nature as the Keyblade that Sora holds. However, there is no full explanation for the "Soul Eater" being generated as an intermediary [for the Way to the Dawn], or [the Keyblade that Kairi possesses] being handed over to Kairi from Riku, and when it's not close to the normal obtainment procedure, I think it's okay to feel that there's something more than meets the eye." This page was last edited on 3 April 2019, at 18:00.